The reclusive Russian maths genius who solved one of the world's most perplexing mysteries said in a rare interview Thursday that he began his training by figuring out how Jesus walked on water. 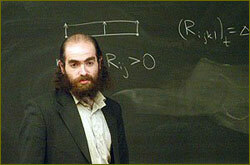 Grigory Perelman shot to international fame by solving the seemingly intractable Poincare conjecture and then turning down the million-dollar prize awarded in the mathematics world's version of the Nobel. The 44-year-old now lives with his mother in a working-class Saint Petersburg high-rise and studiously avoids the press. But he told the mass-circulation Komsomolskaya Pravda daily that he and other Soviet-era students developed their prowess by learning to think in abstract terms at a very young age. “A baby starts gaining experience from birth. If you can train the arms and legs, then why not also the brain,” Perelman said in the interview. He said his grammar school class never encountered an “unsolvable” problem but faced a tricky one when asked to solve the Biblical mystery of how Jesus managed to walk on water. “I had to solve how fast he had to be walking across the water in order not to fall through,” Perelman said. The Poincare conjecture is regarded as one of the most important questions in topology - a geometry-related branch of mathematics that deals with spatial properties. It essentially asserts that any shape without a hole can be stretched or shrunk into a sphere. Perelman published his findings on the Internet in 2002 and 2003. City news archive for 02 May' 2011.